This free-to-play base building strategy game is similar to Clash of Clans and other games of the genre but with Transformers. 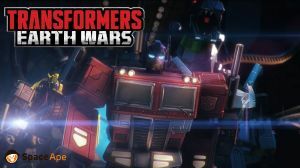 Players choose whether they want to belong to the Autobots or Decepticons camp where each faction has nearly eighty characters to unlock and level up through combat. Unlocked Transformers can be viewed in a hanger with an option to tap on them to change them into vehicle mode. The game however has one big downside and that is it can take a while to earn and save up enough resources to perform important tasks.